UHN welcomes nearly 7,000 students each year from around the world, through our affiliations with many institutions of higher learning. Our principal affiliation is with University of Toronto; however, we have formal teaching arrangements with over 90 institutions. We are pleased to welcome you as a learner at UHN. Are you seeking a placement? Do you have a confirmed placement? What about Interprofessional Education at UHN? Part of the University Health Network, The Michener Institute of Education at UHN embeds a school within a hospital, giving students direct access to real-time, front-line insight that shapes its curricula. Michener has five campuses in downtown Toronto, and is the only academic institution in Canada devoted exclusively to applied health sciences. The student-to-faculty ratio is exceptional and offers state-of-the-art equipment and simulation opportunities that prepare students for the real world of health care. 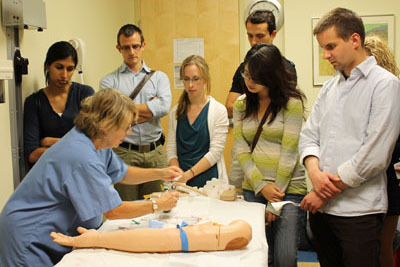 The Centre for IPE is a cornerstone of the IPE Program at UHN and UofT. Focused on the interface between education and practice, the Centre brings together health care professionals from all areas to enhance IPE, research and care. Learn more about IPE at UHN. UHN is a fully affiliated partner of U of T. We are proud to welcome learners from all areas of the university – Medicine, Nursing, Pharmacy, Social Work, Occupational Science, Occupational Therapy and Physical Therapy. Learn more about the University of Toronto.